I actually didn’t know anything about this book before Yekyung told me about it (special thanks to her for the gift! ); she described it as a well-known book that many Koreans in their twenties have read. It’s also been made into a movie, which I hadn’t seen or heard of. I decided to start reading this book “blind” – as in, not knowing the story beforehand, since all the other novels I own are stories that have been made into dramas or movies that I’ve already seen. I think that was a good initial reading strategy; the fact that I knew the plot beforehand really helped me understand the novels themselves, even if I didn’t understand every single word. Now, however, I want to challenge myself a little and go into this novel not knowing anything, and then watch the movie afterwards. All I know from the summary alone is that the story is about a woman who has tried to commit suicide several times and a man facing capital punishment for murder, whose lives are brought together by a Catholic nun. I’m only 55 pages into it and it’s already quite sad. I’ve read several Korean reviews online saying that the book made them cry – I’m curious to see if it’ll end up making me cry (granted I don’t cry easily). 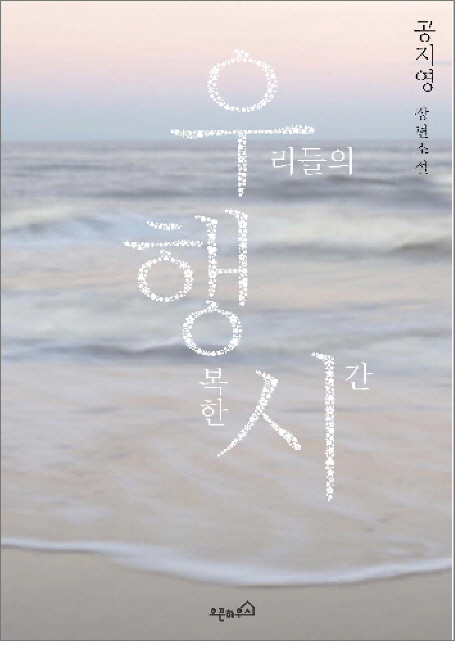 The 설레임 I felt while reading 해를 품은 달 definitely proves I can be moved by Korean prose, but enough to bring tears to my eyes? Well, we’ll see. Speaking of prose, it’s a very lovely read but there is A LOT of figurative language. Metaphors and similes galore. I think I’d be frustrated if this book were in English, but this type of writing seems more forgiving in (and dare I say more suited for) Korean. Overall, it has a very somber and melancholy tone and both characters have an introspective style of narration which might make for a very heavy read, but surprisingly it’s not. I’m actually really taken aback by how readable the book is despite its story, and not only in the sense that I can comprehend what’s going on. I keep turning the pages, never feeling like I need a break to recover from the heaviness of the plot (lookin’ at you, Russian literature). Hope I’ll finally make it to the end of this one! I have a bad habit of buying Korean novels, flipping quickly through them, reading all the easy parts, and never going back to properly read them from the beginning. 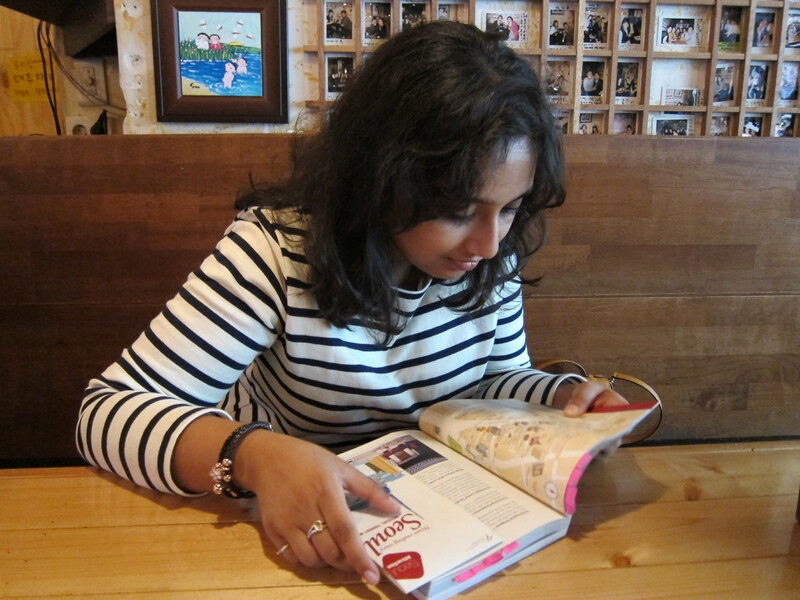 Or worse, I buy Korean novels and don’t get any further than sniffing the pages…. That’s right. It’s been nearly three years since I started studying Korean, and I’ve finally started a notebook. During the early days, I learned a LOT of grammar from songs and my “notebook” was actually just a binder full of song lyrics. I had the Korean lyrics on one page and 3-5 pages of detailed grammar and vocabulary notes stapled behind it – a compilation of stuff I looked up in books and read on the internet. Then as I started reading more, I had sheets and sheets of vocabulary words (in blue and black) and grammar points in red, which I organized in order of the the books and/or articles I read, in the same binder. Now, I plan on taking TOPIK sometime in 2013 (I think it’s only offered annually in the US? I have to check the dates), and it’s getting harder for me to retain those not-so-common grammar points, so I decided to start a grammar notebook. I’m still sticking to loose-leaf paper for my vocab notes because I like organizing them according to the source material (and I read a lot of stuff simultaneously), but I think it’ll be useful to build my own grammar dictionary of sorts. Anyway, here’s a page from the new notebook! I’m in the process of recopying some old grammar points I’d written on scraps of paper ages ago. Look at those lovely colors! Jeannie sent me these pens from Korea and I LOVE the super-super-fine point tips. I don’t think I’ve ever seen 0.3 tip pens in the US. Happy 한글날 to all my fellow Korean learners! 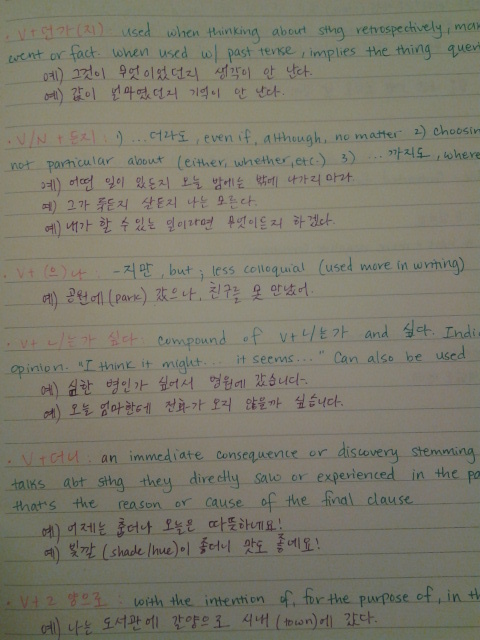 For various reasons, I have always avoided telling Korean people that I know Korean. Not that I’m shy or afraid of making mistakes… I’m somehow hyper-conscious of unintentionally objectifying the him/her. As in, “I want to be your friend because you’re Korean.” People are individuals, not a race. I never want the other person to feel like I’m his/her friend simply because s/he is Korean. I want our friendship to be built on more than that. So when I volunteered to host my friend Yekyung during this year’s interview weekend, I didn’t tell her I knew Korean until our very last email exchange before we were to meet in person. In the post-script, I wrote one short sentence in Korean, telling her to feel free to mix Korean and English with me if she liked. At that point, keeping it a secret would just be rude. I think I’ve mentioned Yekyung on this blog a couple times. She is now a very good friend, a really great 언니, and a fantastic language partner of mine. This weekend, our program had its annual scientific conference by the beach and Yekyung was my roommate for 3 days – it was great! I mean, aside from the fact that she’s an incredibly sweet person and a wonderful roomie, she’s an incredibly strict language teacher. One of the best things about being friends with her, is that she got over the “한국어 잘 하시네요” phase pretty quick. When I speak in Korean, she actually listens to what I’m saying, she corrects me without reserve, and, yes, she praises me a decent amount, but not so much that it’ll get to my head! I love that whenever we chat, at least one of us is getting language practice. She gets to practice English with me, but also has the luxury of switching back to Korean when she feels like it. I still find it difficult to hold conversations in 100% Korean, but it’s getting easier and easier to intersperse my English with longer and longer Korean sentences when I’m with her. And, man, is she a strict conversationalist! One day I said something like “스탠포드 처음 왔을 때, 너무 umm because it was like so big 길치니까, 걱정 됐어” and she just gave me a look and said, “Um? Because it was like so big? What is that? And there is no such thing as um in Korean!” Haha. We like to share our language worries with each other. It turns out that many of the difficulties I have in Korean, she has in English. One of them, for example, is not being able to follow a conversation that’s taking place in a loud setting or with lots of people talking at once. Another being not knowing simple words (Yekyung: “Do you know 국자? The long spoon that you put in soup? I don’t know that word.”) It makes me feel like we can really help each master each others’ language. Best of all, I never feel alienated from Korean when I talk to Yekyung. There’s never this sense of, “Oh, you’re not Korean so I won’t speak in Korean with you.” I mean, she’d wake up in the morning half-asleep and say “어 일어났어? 몇시야?” to me, like it was totally natural for her to speak to her non-Korean friend in Korean like that. It was great. I think I was the one only who kept thinking it was all amazing and unbelievable that I was actually speaking in Korean while Yekyung was totally unfazed. Haha. I think I even asked her like three times, “실제 언니라고 부르면 이상하지 않아?” and she looked at me like I was crazy, because what else would I call her? Hehe. A couple months ago, there was a period of time during which I texted and spoke to Yekyung only in English because I figured, as a graduate student in the U.S., she should really practice conversing in English as much as she can. In fact, it’s probably selfish of me to try to talk to her in Korean for my own practice. But Yekyung actually encourages me to speak to her in Korean. Once we went out for brunch and I started talking to her in English but suddenly she interrupted me saying, “한국말로 해봐!” I feel an incredible surge of happiness whenever she says that (and she says it a lot!) because it makes me feel like she really cares about helping me improve. I think it’s pretty clear that I’m still overly sensitive about how Koreans might view me as a foreigner with in interest in their language and culture, but Yekyung’s really helped me become less self-conscious. And I feel myself getting better and becoming more confident with each passing day. Here’s to both of us mastering our language of choice! 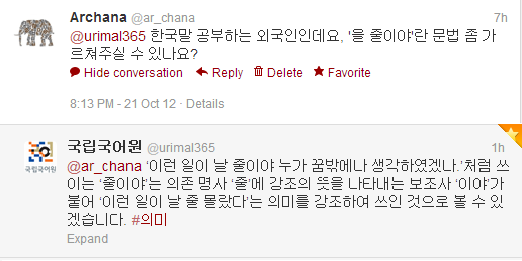 September 28, 2012 by ArchanaLeave a Comment on 니홍고 감바리마쇼! I know I’m not the first language blogger to stumble across these videos, but I thought I’d share them anyway. 니홍고 감바리마쇼! (만화로 배우는 일본어) is a YouTube web series that aired from 2010-2011 designed to (you guessed it) help you learn Japanese through Korean. The videos basically run like a podcast, except with cute little comics depicting the scenario around which each lesson is built. It would have been cool if the story in each video built on the previous one like an ongoing drama, but it’s still cute that there’s a cast of recurring characters. There’s the bumbling protagonist Park-san, his girlfriend of sorts Sayaka-san, his younger brother in the army Hyunwoo, and their smart-aleck cat Gongnyangi. I love how the hosts actually spent time developing their characters. Speaking of whom, the hosts, Rin and Sho, have great chemistry with each other. I’m proud to say I can mostly understand both their banter and their explanations! Each video is centered around one word or phrase but the full dialogue is pretty complicated stuff for a beginner. That being said, it’s not necessary to completely understand the grammar (nor is that the point) because the hosts do a good job of summarizing each line in Korean and only emphasizing the word or phrase that is the focus of the lesson. In the later videos, they annotate the key vocabulary words in the dialogue at the bottom of the video and provide a quiz later at the end. Again, the emphasis is more on learning vocabulary than grammar. These videos are adorable but I’m not really sure how much Japanese I’m learning… I seem to be absorbing more Korean, haha. Be sure to check out these videos if you’re learning Japanese and Korean. Props to G9 Languages for creating another great service for language learners. If you make it to the credits, you may catch sight of some very familiar names right at the end!